Several public events are slated to celebrate the dedication of the Lewis-Sigler Institute for Integrative Genomics and the Carl Icahn Laboratory on Thursday and Friday, May 8 and 9. The events include a reception and dedication ceremony in the laboratory's atrium at 3 p.m. May 8. Afterward, at 4:30 p.m., David Botstein, who will become the institute's director in July, will give a talk on "Genomics, Biology, Medicine and Education" in the Lewis Thomas Laboratory Auditorium. The following day, May 9, a symposium will take place from 2 to 5:30 p.m. in Lewis Thomas Laboratory Auditorium 003. Full details of the dedication and symposium can be found on the institute's site. Construction of the 90,000 square foot building began in early 2001. Scientists from the departments of molecular biology, physics, chemical engineering and computer science began moving into their new labs this past January. The bright and welcoming atrium exemplifies one of the building's objectives: to bring scientists working in various disciplines together in one space. The need for interaction has been a driving element in both the conceptual and physical design of the institute. To achieve that result, architect Rafael Viñoly worked closely with the institute's founding director Shirley M. Tilghman, now Princeton's president, to design the Icahn Lab for maximum flexibility and collaboration. The building's design addresses more than functional issues, as well. The expanse of glass that encases the atrium is shaded by two-story louvers that move with the sun and cast shadows in the double-helix shape of DNA. In an additional detail, the atrium is graced by a Frank Gehry-designed sculpture -- a voluminous, undulating metal shell supported by a seemingly delicate wooden framework -- which doubles as a conference room. Tilghman, Botstein and Viñoly will speak at the dedication ceremony, along with alumni Peter B. Lewis and Carl Icahn. The institute was established through a gift from Lewis, who is a member of the class of 1955. It is named to honor the friendship between Lewis and his classmate Paul Sigler, who was one of the world's leading structural biologists and who died in 2000. Construction of the laboratory was made possible by funding support from the Icahn Family Foundation. Icahn, founder and president of the foundation, is a member of the Class of 1957. 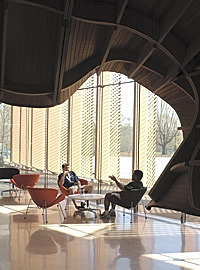 Two molecular biology graduate students sit near the atrium sculpture in the new Carl Icahn Laboratory. 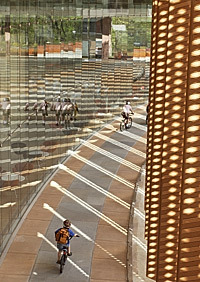 The laboratory, which houses the Lewis-Sigler Institute for Integrative Genomics, includes a variety of creative spaces designed by architect Rafael Viñoly.